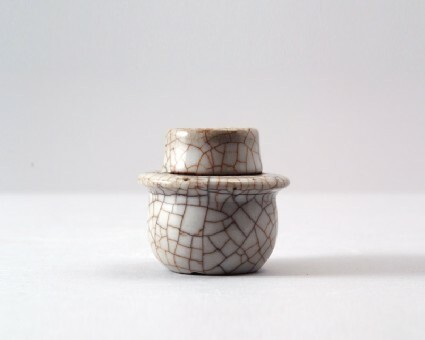 Although made of porcelain, the body of this piece has been coloured with iron to appear brown, in imitation of crackled stonewares made by the guan (‘official’) kilns at Hangzhou in the Southern Song period (1127–1279). The piece has slightly rounded sides with a concave base, a wide everted shoulder collar and a straight neck, somewhat tapering towards the rim. The thick light grey glaze has a prominent dark-stained crackle. The glaze leaves the base free and pulls away at the collar, the glaze gaps revealing a dark brown porcelain body.